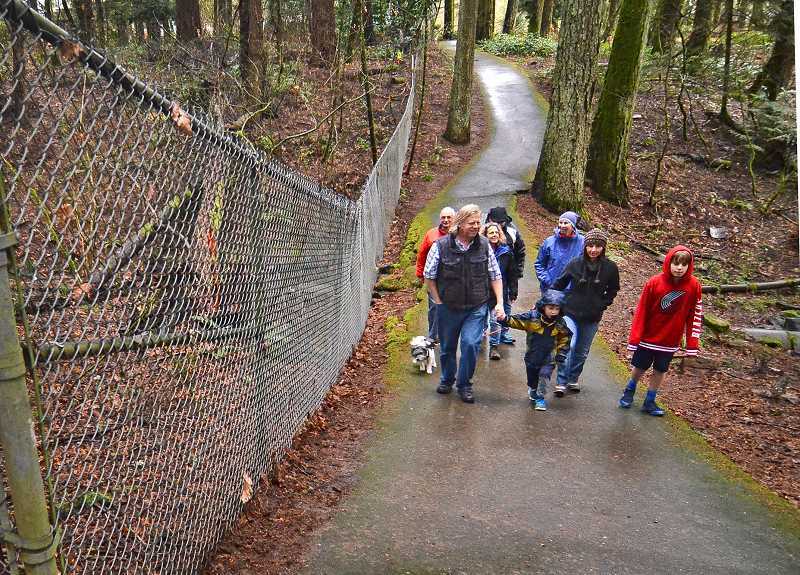 Neighbors advocating for an expansion of Hallinan Woods scored a victory last week when Lake Oswego's Parks, Recreation and Natural Resources Advisory Board opted to place the project near the top of its list of priorities for future Parks & Rec dollars. A final version of the list still needs to be approved by the City Council, and the inclusion of the high-ranking Hallinan line item is not a guarantee that the project will happen, even if the council signs off. But for the group of neighbors who have spent years campaigning for the project, just getting it on the list is an achievement. "We were very happy with that result," said Donald Mattersdorff, who was one of the first neighbors to begin advocating for the park expansion. "There's a long, gradual process, and it's a matter of showing the tremendous support for this project to the people who decide. So I think it's safe to say we were very satisfied with the results from those meetings." The Parks Board is tasked with creating a detailed project prioritization list because the department needs to map out what to do with possible new revenues. A trio of Parks bonds are scheduled to expire in the next four years, and the board hopes that all three can be renewed in a single ballot measure sent to city voters in 2019. "Because there hasn't been a bond for 15 or 20 years and the (System Development Charge) monies are relatively scarce, there just hasn't been a ton of money available to start to address some of these projects," Board Co-chair Bill Gordon said. "So it's been a bit of a theoretical exercise. But now we have the prospect of going to the citizens and asking for these bond renewals." If the bonds are renewed, they would bring in an estimated $22 million in Parks revenue that could be put toward some of the department's standby projects. The highest-ranked items on the Parks Board's tentative priority list include building a new Parks & Rec Center, revamping the public golf course and completing a series of upgrades to the City-owned Luscher Farm — although the priority list and the allocation of bond dollars are subject to change. The list would be reviewed again with citizen input if the bonds are approved by voters. Hallinan Woods currently consists of 3.75 acres of public wooded area directly north of Hallinan Elementary School, and includes a stream and walking trails. The neighbors are seeking to expand the woods by having the City purchase an adjacent two-acre piece of wooded property located directly north of the main portion of the park. The private property is separated from the public woods by a chain-link fence along its southern and eastern perimeter, but it is mostly undeveloped and visually indistinguishable from the rest of the wooded area. The neighbors have argued that the public and private sections are one contiguous wooded area and should be treated as such. The private property was purchased in 2013 with the intention of eventually developing it for housing, a plan that spurred a small group of neighbors to mount a long-shot public campaign to try to convince the City to buy the parcel from the current owner before development begins. The property's owner, Raghunandan Kamineni, told The Review in 2016 that he would be open to discussing the possibility of selling the land for its full value if the City were to approach him, but said that he doubted the City would have the necessary funding. The neighborhood movement grew substantially and became more organized during the past two years after the development plans began to take shape, and the issue is now approaching a make-or-break point, according to Gordon. "The owner has submitted a land use plan to the City that included a small development of six lots — a subdivision — and the Planning Department looked at that application," Gordon said. "Apparently there were some questions, and so the owner has until mid-July to respond. And then because it's a subdivision, the project would need to go to the Development Review Commission." The Hallinan advocates stepped up their campaign in recent weeks, and many attended a Parks Board meeting in mid-May to advocate for the project. A half-dozen group members testified in support of the project during the public comment period. The group now has more than 500 signatures from residents in favor of expanding the park, according to Sarah Ellison, one of its leaders. The project has also received letters of support from five neighborhood associations, all five members of the Lake Oswego School Board, the principal and PTO president of Hallinan Elementary and a number of environmental organizations. "There are plans in the works to develop an educational program for natural areas," Ellison told The Review, "so they see this as a great place for that to happen for Hallinan Elementary." The neighborhood group has also been raising funds to help cover the cost of purchasing the land. They've already secured a $30,000 grant from the Clackamas Soil and Water Conservation District, Ellison says, as well as approximately $17,000 from private donations. The five supporting neighborhood associations have also jointly applied for a Neighborhood Enhancement Grant to help fund the purchase. At last week's prioritization meeting, several Parks Board members cited the strong public demand as a reason to make the project a higher priority. In particular, board members noted that the demand wasn't solely coming from Hallinan residents. "The Parks Board in the past had attached a lower priority to this project, but based on extensive community involvement and fundraising, I think many of the board members felt that the possible purchase of land deserved a chance," Gordon told The Review. 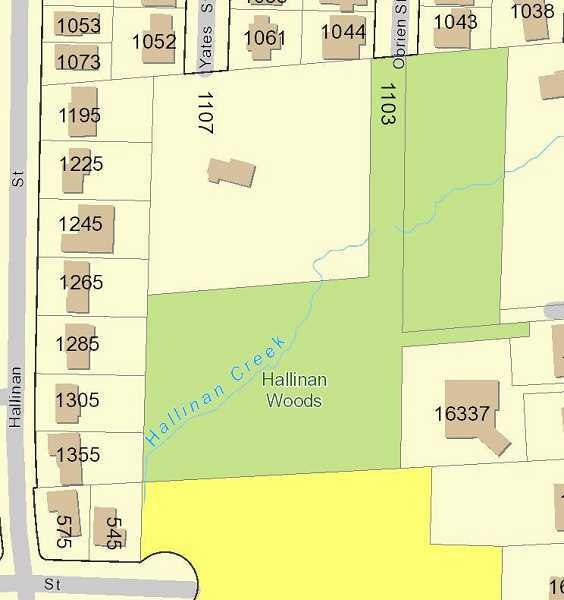 The potential Hallinan Woods purchase was tentatively ranked No. 5 out of 19 projects — a substantial jump from previous versions of the list, which simply listed the project as one of many ideas under a broader land acquisition line item. There likely won't be enough funding to get to the items at the bottom of the list, but ranking the Hallinan project at No. 5 puts it firmly above the cutoff. "The Hallinan Woods project is reasonably close to the top (of the list), so I'm assuming that will generate some discussion among the City Council," Gordon said. "And perhaps some direction to City staff — particularly Parks staff — to start to research what it would take to buy all or some of that parcel. And of course, a key question is how much it would cost." The board also discussed the possibility of negotiating with the property owner to acquire only a portion of the property, such as the perimeter on the south and east sides adjacent to the City's portion of Hallinan Woods. The board's ultimate recommendation to the city was to explore all options, including both a full or partial property purchase. "There's been nothing done right now in terms of thinking about a partial purchase," Gordon said. "Obviously it doesn't have to be all or nothing, it could be a transaction for some of the property." Unlike most of the other projects at the top of the list, the Parks Board didn't allocate any potential bond funding for Hallinan, because the revenue would come too late for the City to make a purchase offer before development begins. Instead, the board suggested paying for the purchase using a combination of SDCs and other revenue, such as grants. Gordon stressed that all of the revenue and cost numbers on the list are only placeholder estimates until each project reaches a development stage where there's a definitive price, and that's especially true in the case of the Hallinan property. The property was purchased in 2013 for $750,000, but its actual value is something that would need to be negotiated if the City decided to try to acquire it, and several members of the board expressed reluctance about giving the project a high priority without a clear price tag or bargaining plan. The board initially considered allocating more than the previous purchase price, but board Co-chair Scott Bullard cautioned that the City doesn't generally pay for property based on its potential value after future development, and pointed out that the current owner's development plans have not yet been approved by the Development Review Commission. "We don't pay commercial 'what-it-means-to-a-developer' prices," he said. "We're way off that scale right now." In the end, the board opted to allocate $800,000 (the purchase price rounded up) on the priority list until a more definitive estimate can be calculated. "It ended up at $0.8 million, and that was not our estimated purchase price or our effort to say that's the maximum purchase price," Gordon said. "It only represents the estimated acquisition price by the current owner. So we're not at all saying that represents the market value of the property." The board is scheduled to present the list to the City Council on June 19. In the meantime, supporters of the park expansion are savoring their victory — with an eye on the next phase of the campaign. "We're so grateful that the Parks Board is noticing the community's support for this project," Ellison said. "We're hoping to raise between $75,000 and $100,000. That's our next goal, because we're going to continue working together in partnership with the City to help them acquire the property."